Posted on May 31, 2018 by Kelly M.
What a busy week! 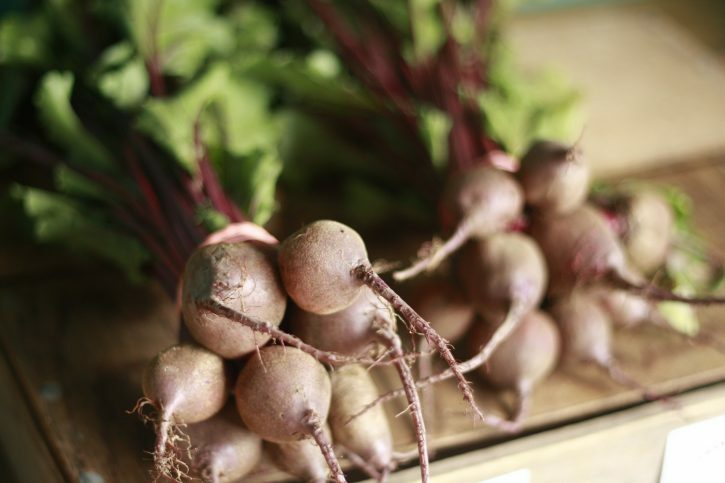 We’re halfway through our Spring CSA and gearing up for a bountiful Summer. We did a lot of planting and began weeding in earnest with much appreciated help from three volunteer groups. On Tuesday, thirteen volunteers from the insurance company AmWins planted our first round of broccoli and all of our peppers. 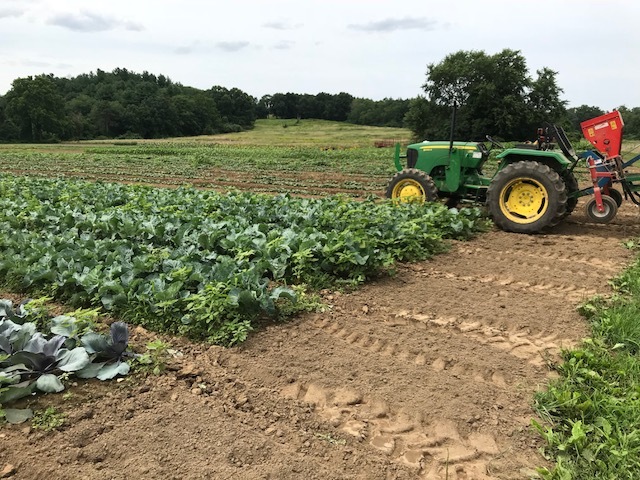 Then, we ended the day by covering the broccoli to protect it from flea beetles. The next morning, we removed the cover from the first four beds of onions that we planted in the last week of April, as the onions have reached a size of maturity where they can withstand damage from the onion fly. Also, weeds had grown up so thickly in the warmth under the cover that it was difficult to even make out the onion plants! The team did a great job hoeing between the onion rows and knocking down the majority of weeds. We were helped by twenty-one volunteers from Care.com who pulled the in-row weeds, which was a big job. 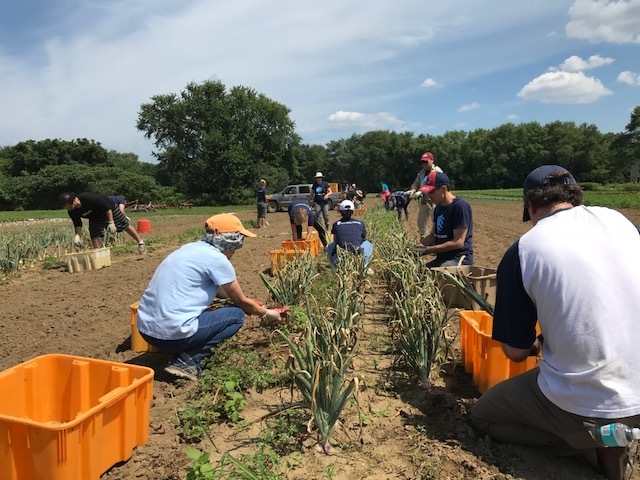 Some volunteers also helped us remove the flowers from the first-year plants in our newly planted strawberry patch, while others began transplanting 4,500 leeks. The flower clippers joined the leek planters, and many stayed late to finish a bed. 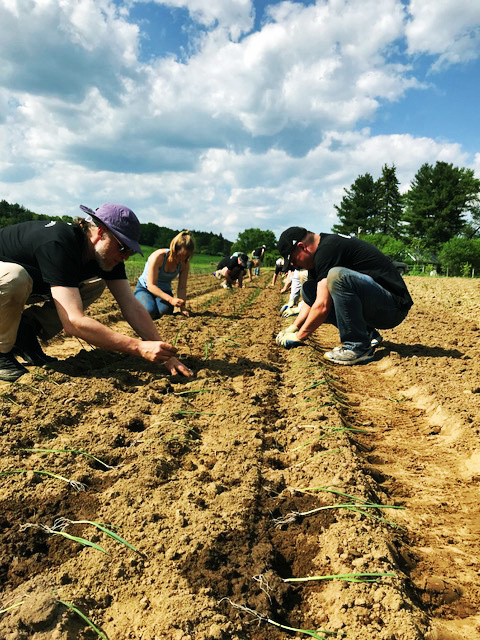 Seniors from Middlesex School planted the last tray of leeks the following day, weeded two more beds of onions, and planted the next succession of basil and scallions—2,200 seedlings in all. Thanks to all the volunteers for your amazing help. With many different groups of volunteers working on different parts of the same project, your contribution allowed us to meet our goal for the week, which was to finish planting all the nightshades. Because of what we accomplished earlier in the week, we had time to plant the first succession of eggplant on Friday and tomatoes on Saturday. While the rest of us worked with Care.com volunteers on Wednesday, Andrew Kelliher and Sarah Lang broke away to prepare a room for a meeting of area farmers. 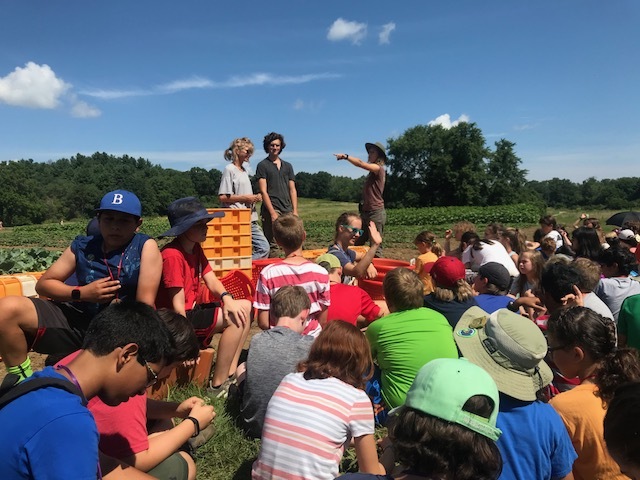 Farmers from Lexington Community Farm and Clark Farm in Carlisle gave presentations on crop planning and microgreens growing to an audience of beginning farmers, finishing with a tour of Drumlin Farm’s crop fields. Around dusk we saw five deer coming down the Drumlin and across the bobolink field. For now, they seem to be eating only cover crop but if they find the carrots, we’ll have to begin spraying Liquid Fence repellent, a natural product made from rotten eggs and garlic oil; deer hate the smell. 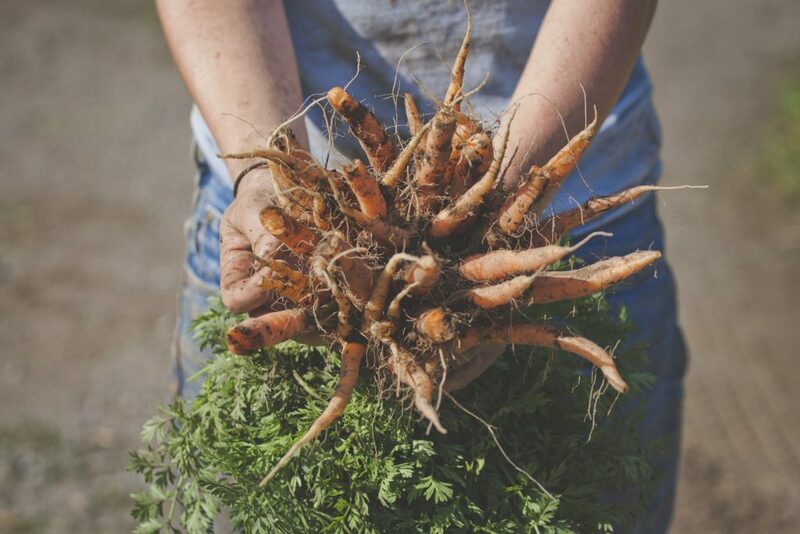 In the week ahead, we’ll plant melons, the second round of sweet corn, and more flowers, as well as harvest cilantro and kohlrabi for the first time. 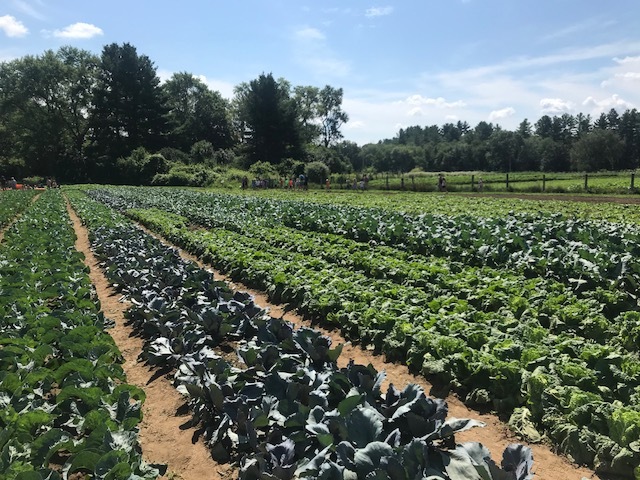 This entry was posted in Farming and tagged community supported agriculture, crops, crops update, csa, farming on May 31, 2018 by Kelly M.. The team is picking strawberries right now for restaurant orders and for the farm stand. Some people came out during Saturday’s rain and humidity to take advantage of Strawberry Day and were rewarded with what one chef has told us are “best tasting strawberries around this season.” Last week, we had lots of strawberries ripening in the patch, and volunteers from Net App helped us pick pints for the CSA. This is something we would not have had the people power to do on our own, so CSA members can thank Net App for the treat! We are now scheduling a weeding job for each volunteer group because the weeds are really taking off with the rain and long days. 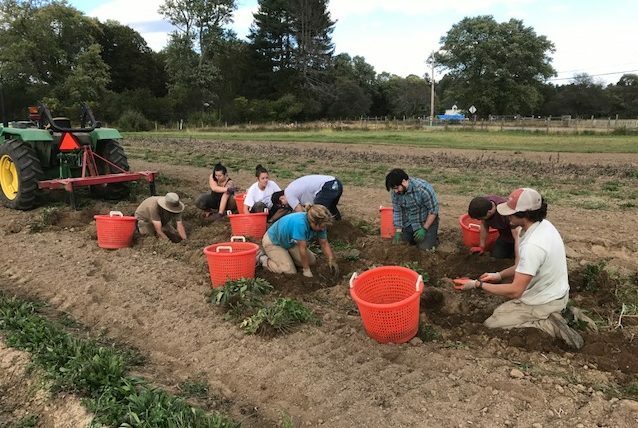 Civil engineers from Green International Affiliates (one of our new Community Partners) weeded carrots, planted basil and picked sugar snap peas for Saturday’s market. Thanks for your focused work, Green International. 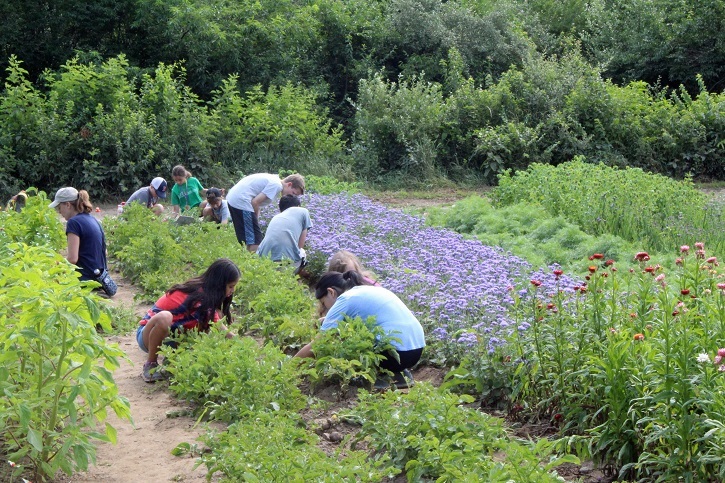 On Saturday, parents and children from Marathi Mandal of Boston volunteered in the field. 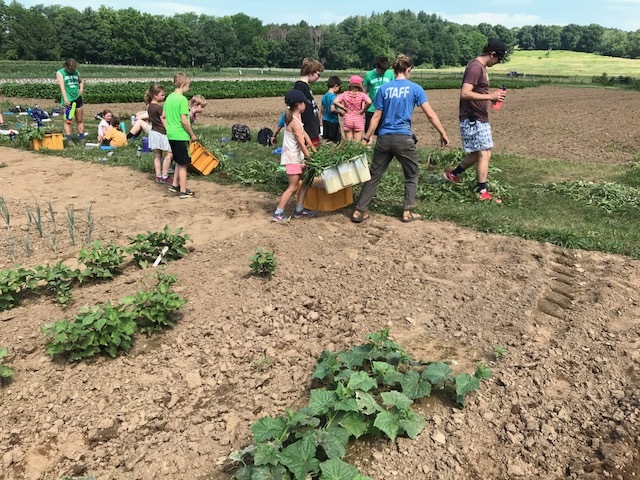 We enjoyed weeding carrots, planting sunflowers, and harvesting peas with these volunteers. 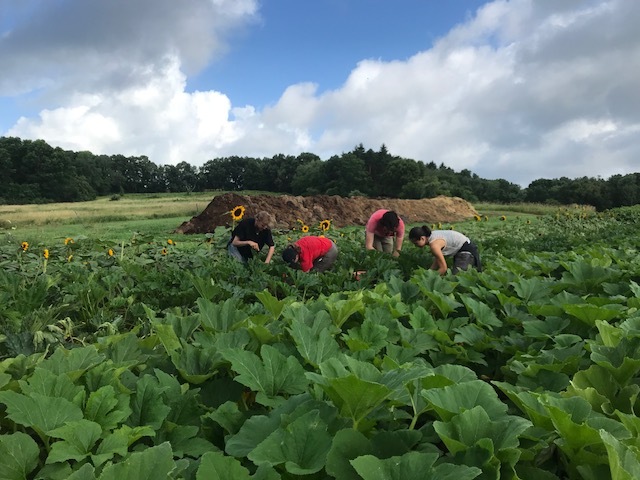 And finally, we’re approaching the last big planting project of the year: One half-acre of pumpkins with the help of volunteers from Phillips Medisize. 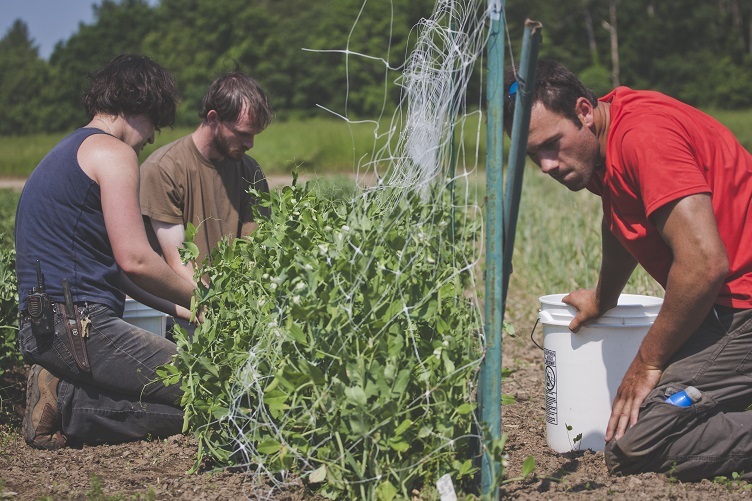 Last week, Andrew, Josh, and Avril worked late to put the first line of twine on all the early tomatoes and planted the second succession of tomatoes. Thanks all for the extra time and effort. 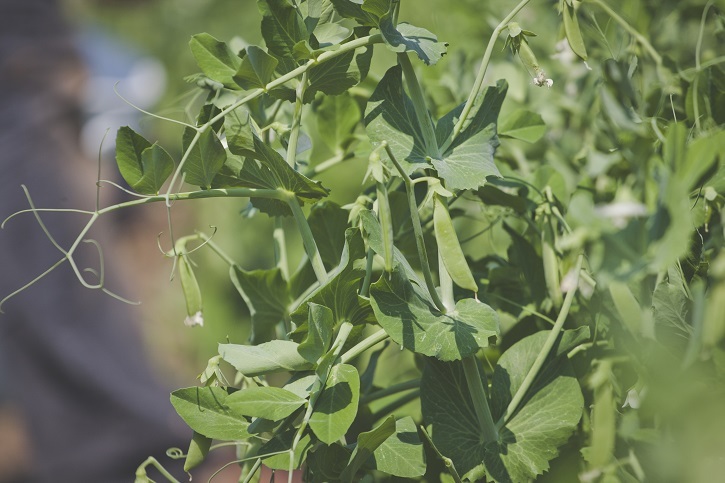 We also have storage crops on our mind. 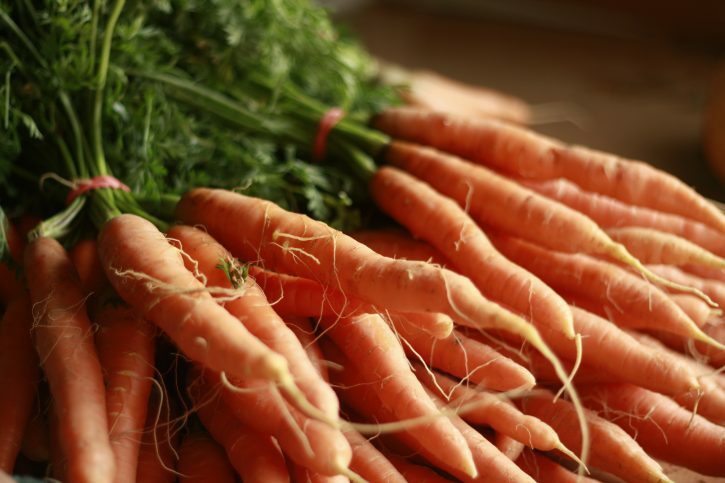 We will soon transplant storage cabbage to the field and seeding carrots intended for the root cellar. Purple spring onions are just now reaching bunching size, and we will soon be harvesting the first summer squash and cucumbers of the year. Garlic scape season has ended, and the bulbs have a few more weeks to grow before we bring them into the barn. 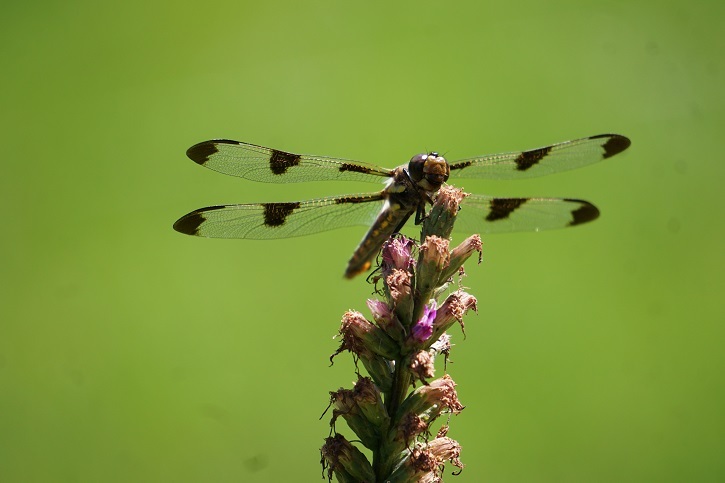 This entry was posted in Education, Farming, News and tagged csa, farm-to-table, farming, local, organic, sustainable, veggies on June 27, 2017 by Staff.